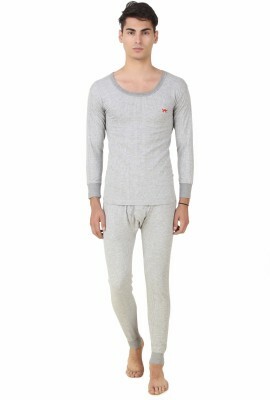 HAP KINGS brings you the finest cold weather underwear. Made with a unique combination of polyfill sandwiched between layers of combed cotton, it keep you warm and comfortable. These quilted thermals are designed to give a contoured snug fit and can be worn under any attire.The rich Light Grey Melange is a must have in your winter wardrobe. This set includes a round neck thermal top and elasticized trouser.